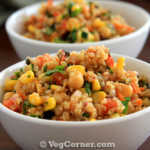 Here comes another amazing vegan recipe from The Joy of Vegan Baking. 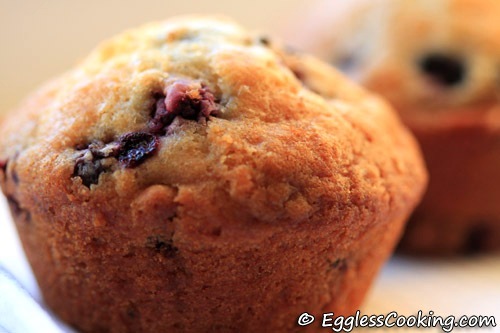 I'm pretty sure that this is the best eggless/vegan blueberry muffins one can bake. The recipe does have a minor flaw (the oven temperature), which can definitely be taken care of. The texture of this muffin is unbelievable. It's as light as an angel food cake, which is made purely with egg whites. You can imagine how light that cake would be. So this blueberry muffins which uses vinegar as an egg substitute is also equally light and airy. I used apple cider vinegar this time and did not get any aftertaste or smell from the vinegar. I made two batches of these muffins, used dairy milk (2%) and lemon zest for the first batch; rice milk and orange zest for the second batch. A few days back I baked a cake using white vinegar and soy milk and was not at all satisfied with the result. It had a strong smell of vinegar and the soy milk made it sticky too. That's the reason I chose to use rice milk and apple cider vinegar for these blueberry muffins. I've baked using soy milk before and didn't have this issue. I think the brand of soy milk and the recipe matters for getting the desired result. Even though I have used lemon zest in this vegan blueberry muffin recipe I'm very confident that using some orange juice instead of the milk and orange zest in place of the lemon zest would be awesome in this recipe because I'm an oranges fan. If you too are an orange fan like me don't miss a chance to try this orange cookie recipe. You will love it! Preheat the oven to 375F (see My Notes) for 15 minutes. Lightly grease a muffin tin. In a medium bowl, combine together flour, baking soda, salt and lemon zest. In a large bowl, combine the sugar, milk, oil, extract, and vinegar. Mix well. Add the dry ingredients to the wet ingredients, stir until just combined. Don't over stir. Gently fold in the berries using a rubber spatula. Fill the muffin tins about 2/3rds full. Bake until a wooden skewer inserted into the center comes out clean, about 22 minutes. Remove from the oven and let it cool for 5 minutes. After that remove the muffins from the tins and cool on a wire rack. I didn't want to bake 2 batches when I started. What happened was I didn't read the recipe properly and poured the measured sugar on top of the flour instead of mixing it with the wet ingredients. I continued with it anyway and saw that the muffins began to brown very much around 12 minutes itself. The original recipe had mentioned to bake it at 400F. So I reduced the oven temperature to 375F. I thought that adding sugar to the flour was the reason and so I baked another batch following the instructions correctly. Even then the same thing happened. That's when I realized that the oven temperature was the culprit. That's the reason I have changed the temperature to 375F in the procedure. Later I was going through a whole wheat banana muffin recipe in The Joy of Baking website and there it was mentioned that baking that muffin directly in a muffin tin without the paper liner would yield crusty and brownish muffins but it would soften later. The same thing happened in these blueberry muffins too. 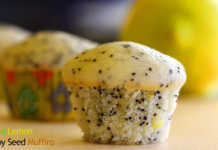 So you may also try lining the muffin tins with a paper liner, instead of pouring the batter in the greased molds. Regarding sugar, the original recipe itself mentions 3/4-1 cup. For the first batch, I used 3/4 cup because the vegan strawberry cupcakes which I tried earlier from the same book used 1 cup sugar and was very sweet. 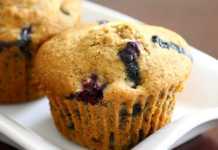 The sweetness of the blueberry muffins was perfect for us, but it may not be enough for everybody, especially if the blueberries are very sour. So for the second batch (I had already decided to give it to my neighbors because I didn't want to have it at home and gain weight), I decided to increase the quantity of sugar. I used little more than 3/4 cup and little less than 1 cup. That was good too. I used frozen blueberries. Thawing is not necessary. Add it to the muffin batter directly from the freezer, but do not over mix, or else it would start bleeding. How much applesauce can I use instead of oil? Would the muffins still be airy if I use applesauce instead of oil? I know that it's easy to get tempted to replace the oil/fat in a baking recipe with applesauce to make it fat-free, but that would result in dense and dry muffins. It won’t be as airy as using oil alone. So I would suggest just replacing half the quantity of oil with applesauce. Since the acidic content of lemon juice is less when compared to vinegar you might have to double the quantity of vinegar. 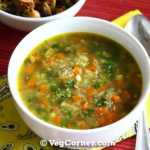 For example, if recipe calls for 1 teaspoon of vinegar, use 2 teaspoons of lemon juice. What is this lemon zest you are talking about? Is lemon zest and extract compulsory? Lemon zest is nothing but grating the skin of the lemon. Care should be taking while doing this so that the inner white sheet from the skin does not peel away because it will be bitter. Lemon extract is like vanilla, almond extract which is in liquid form. 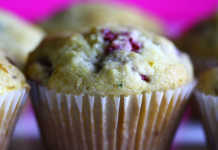 I wouldn't say that it's compulsory but it definitely will give a nice flavor to the muffins. You may choose to use orange zest/extract instead of simply vanilla extract will be good too. Why do the muffins rise well and suddenly sink in the middle? Opening the oven door quite too often while it is baking makes cold air enter in the oven and might be the reason for the muffins to sink. Another reason can be that you used little too much batter for each muffin. Can I make a gluten-free version of these muffins by replacing the all-purpose flour with finger millet flour or almond meal or coconut flour? No it doesn’t work like that . You would have to use xanathan gum. I haven't baked this recipe gluten free and have read that simply substituting the all purpose flour with gluten-free flour would not work especially in baked goods which has to rise, like muffins, cupcakes and cakes. Brownies and cookies should not be that much of a problem to bake gluten-free and can be done without xanathan gum too. Gluten-free and egg free is a lot of trial and error method only. But some of the readers did mention that they tried this recipe gluten-free using rice flour and gluten-free mix (which already has the xanathan gum in it). You may try it at your discretion. I will try to bake a gluten-free version shortly and blog about it soon. Can I just make it egg free instead of vegan? Just use dairy milk and if you prefer butter, melted butter instead of oil. One of the readers suggested that the muffins turn out better if oil is used instead of melted butter though. What oil can I use instead of canola? Any oil of your choice which has a neutral flavor. Peanut oil, sunflower oil, (refined) coconut oil, avocado oil, etc. Would you recommend baking these muffins at 350 F? Will it involve baking for a longer time then? You can try it at 350F but bake it a couple of minutes longer. Can I bake just 6 muffins? Halving the recipe may not work out always. It's again for you to experiment and see. Another option is to bake all the muffins and freeze the remaining and use it later. If you decide to halve the recipe and if you are using a 12 cup pan then you will have to fill the rest of the cups with little water so that the muffins will bake evenly and doesn’t get dried out. 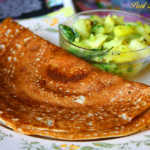 Is it okay to use flax seed meal instead of lemon and vinegar? If so, can you please suggest the amount of flax-seed meal? You can try flax seed meal but I’m pretty sure that the muffins won’t be as airy and as light as the ones with lemon and vinegar. You can try blending a teaspoon of flax seed meal with 3 tablespoons of warm water. I used paper liners instead of greasing the muffin tins. Unfortunately, the muffins stuck to the liners! What do you think happened? 2) If you make it low-fat or fat free 3) If you don't lightly grease the liners with non-stick cooking spray. Does the baking temperature or time change if you are using mini muffin tins? The temperature does not change but you need to bake it for a lesser time than you would bake regular sized muffins. Somewhere between 12-15 minutes. 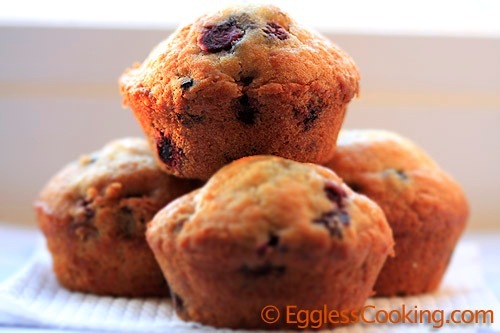 I have baked muffins like in the past and end up with the berries sinking in the bottom. How to avoid it? I have explained it in detail here: Why does fruit sink to bottom of the cake? What is rice milk? Can I use any other milk instead? Rice milk is derived from cooked white/brown rice. You can use any other non-dairy milk like almond milk, oat milk, hemp milk etc. I personally don't prefer using soy milk because it gives a sticky texture to the baked goods. For vegan baking my choice is either rice milk or almond milk. Can I use any other fruit instead of blueberries? 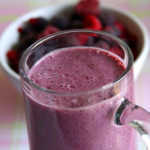 Yes you can use any other berries or fruits of your choice. Or even add ons like nuts, chocolate chips, dried fruits etc. Haa..haa..Thanks for trying the recipe and for the feedback. This is a great recipe, thank you! I was looking for a vegan muffin recipe and tried many different egg replacements, but didn’t realise it could be that easy! Instead of putting vinegar with the wet ingredients I add it last (just before the blueberries) and stir it through quickly, so the mixture is still fizzing while I am scooping it into the tray. They turn out so fluffy! No one believes there is no egg in them! That’s wonderful, Irina. Thanks for the tip about using the vinegar. Will try it. Thank you for the perfect vegan recipe! I made these muffins last night and they were delicious! thank you so mich for this recipe. I didn’t have blueberries at my home, so I used cherries and they turned out just great. I also made a flex egg instead of using apple cider vinegar. It was my first time using this method of egg supplement for muffin-baking and I’m glad I tried it. Wow! Thank you very much for sharing your tip about using flaxseed egg. Can’t wait to try it now. They are very yummy and thanks for the recipe. I made this this morning. It was very delicious. Thanks for the amazing and false-proof recipes ever. You’re very welcome Sasi. Take the muffins out of the even a bit early and it will be soft. It actually became moist after couple of hours. I will try taking it bit early next time, but I am afraid that it might not be fully baked. Sometimes when we don’t cream the sugar that happens. Maybe you can try removing it from the oven 1-2 minutes earlier. It might help. Thanks Sasi. Can you use another oil apart from canola as this oil is not good for you? Yes, any neutral flavor oil can be used. Why can’t you use proper weight measurements? I don’t use cup but I do have scales! Here in the US/Canada we are used to cup measurements. Please check the baking measurements page for weight measurement conversion charts. I followed everything to a T, and when I opened the oven they had exploded and disinagrated. Whhhyyyy?? Sorry to hear this Fonzie but it’s very surprising that it happened because this is one of the most popular recipes here and I guess you would have read the reviews. I’m wondering it the baking powder you used was old or something. Not sure. Aww…thank you so much Sara. I made this using unsweetened vanilla pea milk and orange zest. I got a medium naval orange and used the whole orange for the zest. They turned out wonderfully! It may be my oven but I added two minutes on to baking time. Cannot believe there is no dairy or egg in these! So yummy! Wow, vanilla pea milk!? Haven’t seen it yet! Thanks for the feedback Stephanie. Thank you for this fluffy, tangy muffin recipe! We are newly vegan & I’m looking hard for recipes to make for my very large (9 kids) sometimes picky family. We are in north Houston, sitting out Hurricane Harvey, so these muffins are a very special treat! Oh wow! You’re very welcome and thanks for leaving your comment. Is the batter suppose to be very thick? Should I add more milk if it is thick? I don’t remember the batter being too thick but you can add some milk/water to get the right consistency. Also I used almond milk and gluten free flour! Thanks again. It turned out so good and i used dates instead of sugar and i used coconut oil. Thank you for sharing! Also I used cupcake liners! Best suggestion ever! Thanks for the detailed feedback Erica. You’re welcome. Also, I didn’t use any spray or oil for the liners. Thanks My friends thought the muffins were a hit! You’re welcome Erica and thanks for the feedback. Have you tried with the cupcake liners? Do the muffins stick to the liner? Thanks. Yes I have and it doesn’t. You will have to lightly grease the muffin liners with non-stick cooking spray and also wait for the muffins to cool completely before you can peel off the paper. I used this recipe with almond milk, sunflower oil, and 1/2 c brown sugar and 1/4 org raw fine sugar. I also made streusel for the top with flour, coconut oil, inch of salt and brown sugar. I don’t know the caloric intake, but it was vegan and awesome. Thanks! Wow! That sounds absolutely delicious! Would coconut milk or soy milk work for these muffins instead of rice milk? Coconut milk might be a bit heavy. Soy milk should work but I prefer rice milk because it doesn’t give a rubbery texture like soy milk. Yum! No lemon anything, used water instead of any milk, fresh berries, spelt flour combo and baked at 350 for 26 mins. Turned out great! That’s great to know Jofee. Thanks for the feedback.